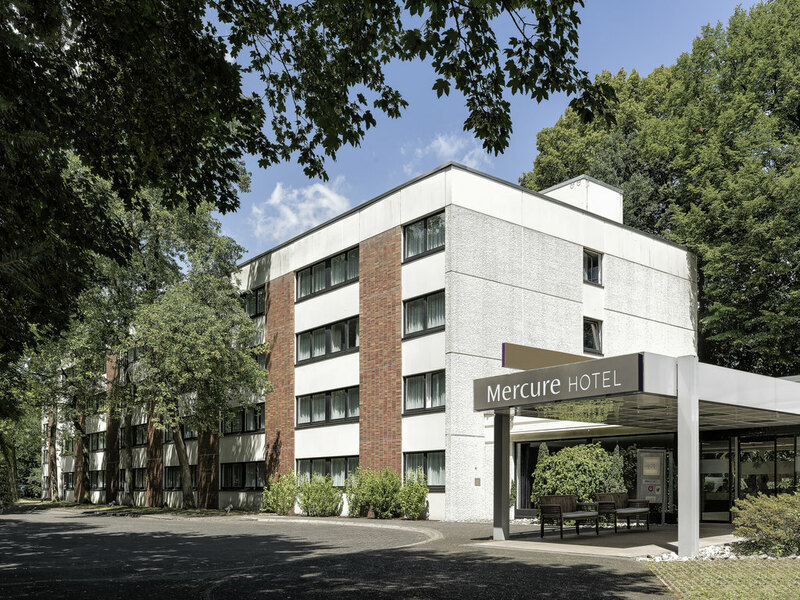 The 4-star Mercure Hotel Bielefeld is located in a quiet park yet is close to the city and has good transport links to the A2 and A33 highways and the Bielefeld ICE train station. The hotel boasts 119 rooms in 3 different categories. All rooms are equippe d with air-conditioning, WIFI and a room safe. The 9 air-conditioned meeting rooms offer capacity for up to 220 people. Come and sample the international cuisine served in our restaurant, bar and on the panoramic terrace. Enjoy modern comfort in leafy surroundings. Set within the Johannisberg parkland, the hotel overlooks the rooftops of Bielefeld. Enjoy wonderful views over the city. The 119 rooms have a modern design and a warm atmosphere. A large desk and free WIFI in all rooms allow you to work comfortably and undisturbed. All of our rooms are equipped with a flat-screen TV. Coffee and tea facilities are available free of charge for our guests. Restaurant and terrace with views over Bielefeld's skyline and Sparrenburg Castle. Regional and international cuisine, breakfast, lunch, dinner, à la carte, set meals and buffets. The food and hotel itself was excellent. The hotel stands high up over the city but a walk of 15/20 minutes places you in the heart of Bielefeld. The hotel is surrounded by parkland and the staff are very welcoming and friendly. There is ample free parking. We stayed for five nights and will be staying there again whenever we visit friends again. Dear Frank, we thank you for the words you have chosen and the very personal, positive feedback on our team and our service. Our globally successful hotel chain thrives on innovative feedback that inspires us to go new ways. We are pleased when you can enjoy our hospitality and our friendly atmosphere during your next stay as well. Best regards, your management team. I had pre payed the booking and had a confirmation that it was already payed. The day before our booking I had a call with them and they confirmed that the booking was fine. However when I arrived at the hotel, I was told that the booking was canceled due to some credit card issues. Which was nothing but a fishy excuse. I had a working credit card with me and the hotel was just overbooked due to an event. The Mercure Bielefeld Johannisberg is located i a very quite park and has very good parking Spaces. A very nice and servicefriendly staff welcomes you and serve you in the bar and restaurant. The bar and the restaurant have very fine choises of drinks and food. A very nice and clean room. Dear guest, thank you for your kind comment! We are pleased that you have felt comfortable at the Mercure Hotel Bielefeld Johannisberg. We had stayed at this hotel before, when it was owned by Radisson. The location is very interesting, on the Johannisberg, with views across the city. The walks into the city are very interesting (if you don't mind down and up hill walks). The hotel is very comfortable, and the breakfast is excellent - with a full range of foods. We used the hotel as a base, so did not experience the bar or the restaurant at other times, or any events that were staged. All staff are very polite and, as usual, speak good English. Highly recommended for a visit to Bielefeld, which is a very interesting city! Great location high above the city centre. Hotel located in woodland setting so good if you have a dog. Staff very friendly and helpful at all times. Executive Rooms have nice comfortable beds with free mini bar, bathrobes, coffee etc. Bathroom a little dated but nice and clean. Great buffet breakfast with a wide choice of hot and cold options including lovely fresh fruit. Super barbecue Thursdays and most Saturdays. Food from main dinner menu was fresh and tasty. If passing through Bielefeld or staying on a short break this hotel is a very good option. This hotel is beautifully located on the Johannisberg in Bielefeld, giving you a great view of the city. It is also closely located to some local attractions like the Tierpark (an animal park where animals live closely to their natural habitat), the Bauernhausmuseum (farm house museum), a climbing park and many hiking trails. The rooms are spacious enough, comfortable and clean. The front desk staff was extremely friendly and made you feel welcome. I stayed in two other hotels during my travel in Germany, and I noticed that phrases like "welcome to our hotel", "enjoy your stay" or "did you enjoy your stay with us?" when checking out, seem to have become outdated. Not so at the Mercure Bielefeld! A small expression of care and interest in customers goes a long way! Nowadays wifi is as important as a proper bed and unfortunately I experienced bad wifi during my several stays at Park-Inn. What I also disliked is that you are only allowed to check in for fast wifi with only 1 device (laptop & smartphone?). Location is very nice upon a hill in a green and lush environment. Rooms are clean and beds are ok. Breakfast is fine with plenty of choice. clean and good beds. Helpful staff! In general I liked staying at Park-inn. Although this hotel is a fair distance from town and the shops, these are reached in only a few minutes by car. The advantage of Park Inn Hotel is the view over Bielefeld, the quietness (no traffic noise), friendliness and efficiency of the staff. The room is good, could have just a little more space between bed and cupboard, especially the superior room. Very good mattrass. We only ate breakfast at the hotel restaurant, and that was excellent. Although this hotel is a fair distance from town and the shops, these are reached in only a few minutes by car. The advantage of Park Inn Hotel is the view over Bielefeld, the quietness (no traffic noise), friendliness and efficiency of the staff. Wir hatten einen Gutschein von Jochen Schweitzer Candle-Light-Dinner. Begrüßungscocktail und Suppe waren ok. Der Hauptgang Rumsteak an Ratatouille mit Kartoffelgratin war nur das Fleisch warm das Gratin total kalt. Nachtisch ok. Wir haben uns beschwert über das kalte Essen und man bat uns ein kostenloses warm Getränk an, das zum schluss doch auf der Rechnung stand. Mein Fazit : Essen gut gewürtzt aber wir würden nicht noch einmal dort Essen gehen. all was well done and we had a nice stay! If only the food(except breakfast) would have been a better value for money..
We were here with the Alfa Club. Satisfied with service, quality of room and location. Only food on both evenings we thought to be below par!! One would expect more from hotel that charges € 104.00 for a room! see above. see above. see above. see above. see above. Friendly and helpful staff, nice room and good food. A nice hotel in an ideal location for access into Town. With pleasant and helpful staff. Very quiet hotel , nice view ,choice and quality for breakfast.